There’s nothing new about battery docks for smart speakers such as the Amazon Echo Dot and Google Home Mini. A battery dock allows you to place the speaker anywhere in a room, not just in the proximity of an AC outlet. But those batteries will need recharging eventually, so most people who use them—myself included—end up leaving battery-docked smart speakers in the same places they’d be if they were AC-powered. A company called Wi-Charge claims it has a better solution: It has developed a battery-charging technology that harnesses the power of light. The power transmitter in this solution must be plugged into a wall, but the power receiver trickle-charges the battery in whatever device it’s plugged into, keeping the battery forever topped off. 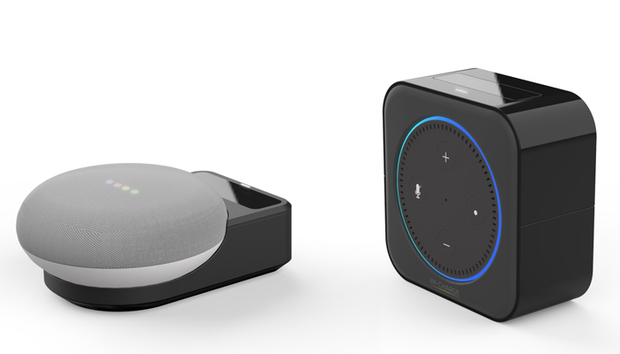 Today, Wi-Charge announced new kits that work with Amazon Echo Dot and Google Home Mini smart speakers, so that the speakers can be placed anywhere in a room and operate without power cords. The kits are essentially a proof of concept right now, meant to draw attention to the company’s “Powered by Wi-Charge” initiative. This program aims to convince OEMs to integrate Wi-Charge’s technology into their own new products—and no doubt to also persuade skeptical journalists like me that this technology is closer to market than we might otherwise think. Interested manufacturers can get wireless charger and power receiver modules, detailed documentation and design schematics, and engineering support when they join the program. The company is already working with three partners, but the products those firms are developing are aimed at commercial applications, not consumer electronics. One Wi-Charge transmitter, mounted on the ceiling or on a wall, can service multiple Wi-Charge receivers. The will have a dock for the third-generation Echo Dot soon. 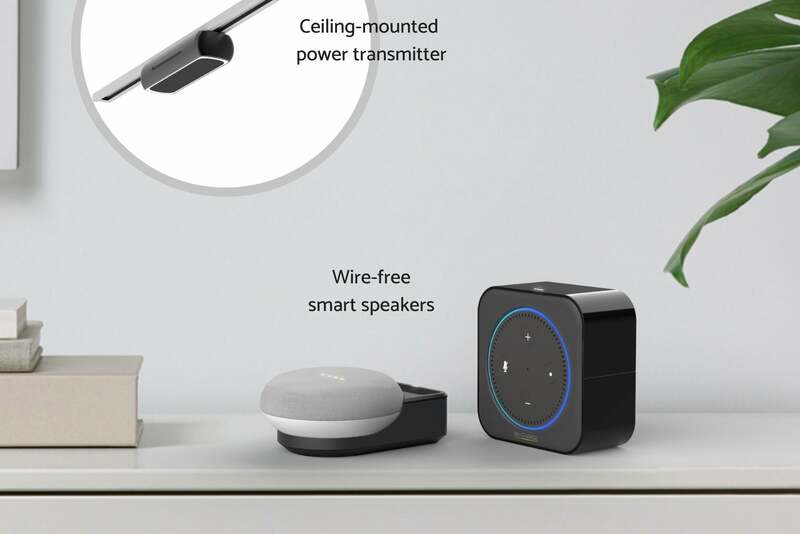 Wi-Charge says its technology can be used with any battery-powered device, including smartphones, tablets, security cameras, Bluetooth speakers, smart door locks, thermostats, and a host of other smart home devices. Existing devices, meanwhile, can be made Wi-Charge compatible with a small USB dongle or—as with the smart speakers—a docking cradle. Motion and door/window sensors are also candidates, although the cost to integrate the technology into such low-cost devices will likely be prohibitive in the beginning. Wi-Charge chief marketing officer Yuval Boger said in an interview Tuesday that the technology will add less than $10 to a product’s bill of materials once it enters mass production. But today's door/window sensors typically cost $20 to $30, and motion sensors are only a little more expensive. A Wi-Charge transmitter mounted on a wall or ceiling sends a focused beam of infrared light to a tiny photovoltaic cell on a Wi-Charge receiver. As you’ve probably guessed, the system depends on the transmitter and receiver being in line of sight of each other. But to avoid requiring the transmitter and receiver to also be perpendicular to each other, a tiny mirror mounted on the transmitter focuses the beam of light onto the receiver’s photovoltaic. The photovoltaic cell then produces electricity by using the photons in that beam of light to knock electrons off atoms. The resulting flow of electricity is then pumped into a battery connected to the device. Happily enough, the mirror also enables one transmitter to service multiple receivers. You will, however, need a transmitter in every room you want the technology to work in—the light can’t go around corners or penetrate walls. Boger said Wi-Charge’s transmitter has a range of about 5 meters (15 feet), which should be plenty for the rooms in most homes. Each receiver, meanwhile, can send messages back to the transmitter, informing it not only as to what type of device it is (a smartphone, a smart speaker, a security camera, etc. ), but also of its battery level, its power requirements, and more. The transmitter can even prioritize charging, so that the devices with the lowest battery levels are serviced first. Boger also described a coffee-shop scenario in which the charging system could identify customers who’ve signed up for the shop owner’s loyalty program and charge their phones while ignoring the phones belonging to other customers who haven’t. Wi-Charge will be exhibiting in CES in January and has already bagged its second CES Innovation Award. The company expects the first Wi-Charge-powered products to come to market in 2019.